There’s this thing Abby and I do, before every soccer game. She’s usually sitting on the wooden bench by our door, in her too-big uniform, and even though she’s in third grade, I’m enabling…I mean, tying her cleats. When I’m done, I give her a pat on the knee and look into her eyes. “Yeah,” she says. The affect couldn’t be more flat. She has heard this before. “You gonna be tough out there today?” I ask. So when I was loading my stock pot full of chili into the back of our car at 8:30 last Saturday morning, on my way to deliver it unto the judges of our town’s first annual Chili-Off, Abby saw her opening. We’d signed up for this Chili-Off — which would take place at the Pumpkin Fair, which raises money for our town’s elementary school — a few weeks ago, and Abby wasn’t the only one having fun at my expense. Jenny, too, had been gleefully applying the pressure, getting all up in my mug about it. (“Remember that venison chili Francine made for us like ten years ago?” she asked a few days beforehand, out of nowhere, which I took as challenge — brazen in its passiveness — to my manhood. “Mmmm, that was so good.” Damn, I thought. Should I be using venison?). The night before the contest, she’d been watching me like a hawk as I got my mis en place going, hovering, looking skeptical, asking me if I was nervous, if I knew anything about “the competition,” if I had a secret ingredient up my sleeve (meaning: you might need one), if I’d be able to show my face at the coffee shop if we lost. But I had waited until 9:00 on the night before the contest to start cooking, and I didn’t have the time or bandwith for new recipes or special ingredients. Go with what you know, as they say, and so I did. I’m not about to abandon the chili I love because there might be someone out there building a better, prettier one. It’s called loyalty, people. Besides, I only know how to make one chili by heart. It’s quick and easy, about thirty minutes of hands-on time, and is a regular in the family rotation. Every Halloween, actually, we make a batch of it for friends and neighbors, who stop in before they go trick or treating, or while they’re out trick or treating, sort an open house kind of deal. It’s a dinner party in a pot. We stick a ladle in the Le Creuset, put some paper bowls and fixings on the counter — sour cream, cheese, cilantro, avocado, chips — and everybody stands around with a glass of red wine and serves themselves. It’s become something of a tradition, and nobody has ever complained about the food. To my face, at least. The chili itself is a pretty straightforward base with lots of possible variations, but for the First Annual Chili-Off, I decided to go classic (beef), with a slight twist (chorizo). The chorizo adds some subtle heat and smokiness and, in general, just really good depth of flavor. I mean, it’s sausage, for chrissakes; it’s not going to make it worse. By 10 pm, the stock pot was in the refrigerator, marking its time until Judgment Day. Almost. Hey, I tried, right? Again, this recipe is super versatile — you can make it with ground turkey, diced sirloin, shredded chicken. If you want to — and I want to – you can even add 1/2 piece of really smoky bacon. Ideally, you’d want to saute the onions and garlic first to build the flavor, but since we were dealing with so much meat and such limited pot space, we browned it in batches, removed the meat, then added the onions and garlic. Brown the ground beef, in two batches, in a large stockpot in olive oil. Sprinkle with salt and pepper as it cooks. Remove to a bowl with slotted spoon. Brown chorizo links for about two minutes a side, and remove to a cutting board. Chop up or slice. Add onion and garlic to the pan with salt and pepper. Cook about 8-10 minutes, in all that beef and chorizo juice, until golden. Add wine, all tomato products and spices, chili peppers, and ground beef and chorizo back. Stir until well blended. Cover at a lazy simmer for 30 minutes to 2 hours, stirring occaionally. Add beans and serve 15 minutes later. LOL. I am seriously smiling all the way through this post. That pre-game conversation is very similar to ones I have w/my son prior to his Hockey games. I’m also judging a charity Chili Throwdown in our town this weekend…so, chili is on my mind. This one looks first place to me. I will definitely be trying your recipe this fall. Thanks for the post and laugh. I loved this story. Especially because I’m a public defender. Don’t get me wrong, we win our fair share. But losing is part of this job. SO in our venacular, congrats on the silver. I actually didn’t even read the post yet. I just had to scroll down and leave my comment in enthusiastic support of your Drive By Truckers t-shirt! F Yeah!!! (we are also raising our daughter on a steady diet of rock n roll). Love your blog. And love your cookbook more. Winning first place wouldn’t have given you nearly such good material for DALS as second seems to have… Well-done, bro. I know how you feel. 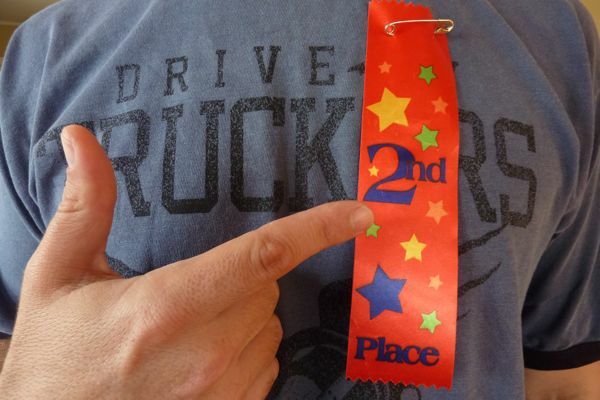 I also came in 2nd in a chili cookoff, and I still swear to this day it was due to biased judges (they were ole’ buddies of the guys who won). The good news is that I was redeemed when I came in first the next year! So keep on keepin’ on. 🙂 Oh, and I do have a secret ingredient…it’s pretty essential. You guys always make me laugh! Sounds delish! I live in New Mexico, where chiles rule, so I must ask what type of dried chile you use in this recipe. Thanks! Love your blog! Nancy, I used dried jalapenos, but tell me: how would you do it in NM? Made a pot of this on Saturday and it is OFF THE HOOK! There are many different types of chiles grown in New Mexico, and we have our own local cuisine based on their flavors. When you go to a restaurant and order enchiladas, the server asks, “red or green?” Red chiles are earthier, green are more piquant. Which is hotter? That can vary on any given day, so ask the server. (If you can’t decide which to have, order “Christmas” and get both.) Green chiles are roasted, then peeled and chopped to make the sauce. Red are most often dried, then ground into powder to make sauce. You can buy the dried chiles and grind them, or just buy the powder. I always love your posts Andy. I made this chili last night with my husband and it was awesome! We had tons of squash and tomatoes from a local harvest and so we pureed and diced the tomatoes ourselves and added some Mexican squash since we figured it wouldn’t change the flavor. Also, I used andouille sausage since the only chorizo I can find around here is the crumbly Mexican kind and I didn’t feel up to going to a specialty market. We loved it! Next time I’m going to add another dried chili and add the smoky bacon. Question: When do we add the wine? It doesn’t say? Thanks! Andy- I know I’m rather late to the cook-off on this one, but my spouse’s secret ingredient is cocoa. That plus your cinnamon may make you the winner! Good luck next Pumpkin Festival. You’ve got some time to try it out. I like beer instead of wine in my chili! I made this tonight. The chorizo was a VERY good addition. This is definitely going to be my new go-to chili – I can’t imagine what #1 tasted like!